Since I began this blog, last September, I’ve been talking about my forthcoming book, A Housefly in Autumn. Before I started this blog, I owned a traditional web site. There, I talked about my forthcoming novel for even longer. Altogether, I’ve spent a long time talking about something happening in the future. If you saw any of these mentions, you may have begun to wonder if the future would ever get here. I know there were times when I did. It took its sweet time, but the future has arrived. If you buy the paperback at Amazon, you can download the Kindle version for free. Just in case you can’t decide which you like best. Today is that day. I can finally hold a real live copy of A Housefly in Autumn in my hands. I can download the e-book to my Kindle. In fact, I have already done both of these things, and now so can you. 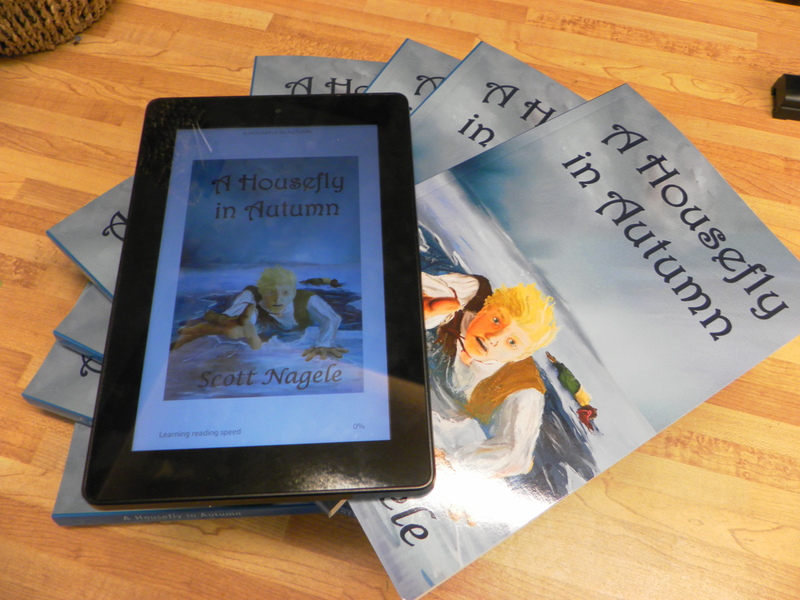 A Housefly in Autumn is available in paper and Kindle formats. This book has taken longer to publish than my previous ones. The editing, the proofing, the cover art, it’s all been a longer trek. That’s why this day is sweeter to me than past release days. It’s the culmination of more investment, more sweat and toil. That also may be part of the reason there’s more trepidation than before. There’s more toil at risk. But the toil can’t be undone so it might as well be pushed with all the other chips into the pot. I’m all in. Now I get to see what kind of hand I’ve dealt myself. A Housefly in Autumn is intended for Young Adults and up. A historical novel, set in 19th century Europe, it follows the life of a young man whose dreams have crumbled down around him. In an act of heroism, he sacrifices his own promising future to save the life of another. Now he must decide whether to cling to the unlikely hope of regaining his old life, or aim his efforts toward making the most of the life fate has dealt him. Though it is difficult to let go of the rewards that life once promised, perhaps the greatest rewards are the ones earned by building new hope from the bits and pieces of wrecked dreams. At 17, Anders Christiansen was a young man overflowing with potential. All his teachers believed he was destined to blossom into a leading man of letters, enjoying a life of rich rewards. That was before the accident. Now, Anders’s great talent lies fallow. He can’t produce the complex ideas he once did. His thoughts are slow and his words simple. The world holds little promise for him anymore. Struggling to build a meaningful life out of the wreckage of his dreams, Anders learns the value of simple treasures. Loyalty, devotion, and even sacrifice hold rewards of their own to renew hope after tragedy. Love can cause hurt, but he who gives love when he hurts the most will reap a joy outweighing the pain. Anders gives meaning to his life in the way he spends it. He will face grave danger to spare those he loves, and though his gifts be diminished, he will share them freely with even the humblest of children. Though never sought, Anders’s reward is immense and enduring, showing the millions of reasons to go on sharing even the simplest of gifts. So now I guess I have to find some new future event to start talking about. Fortunately, my future is full of things that probably will happen but might take longer than I expect. There will be plenty to talk about. Me want one! Me get one! Now. Music to my ears! Thanks!